I gotta say, before Rebellion happened, I believed that in the sequel Junko would reject Madoka's wish after somehow regaining her memories of Madoka. This would then put her into conflict with Homura, who would fight for Madoka's sacrifice. And then Rebellion happened and blew my conception of Homura into the water…but I still can't help but think: If Junko knew her daughter wasn't going to come back, if she knew that it would be the last time she saw or remembered her daughter, would she have let Madoka go? Speaking of Rebellion, it's interesting that Walpurgisnacht is conspicuously absent. There are subtle and not-so-subtle references to Walpurgisnacht in the movie and in the paratext, but the witch herself does not appear. Yet Walpurgisnacht was arguably one of Homura's greatest enemies; it would have been thematically interesting for Walpurgisnacht to fight to bring Madoka and Homura together in Rebellion. There's a part of me that thinks Walpurgisnacht is being saved for the sequel. A very interesting question, especially in light of Rebellion. Although I find it hard to call this a fault of Homura. She's just very human, someone who wants to protect the person she loves no matter what it takes. Can we really fault her in Rebellion for wishing that things would have worked out differently, that Madoka could have lived and been by Homura's side? Is your next project “The Near Apocalypse of 09” a Batman thing (hence the title) or a FMA Brotherhood thing (hence the 09)? It's more ambitious than that, actually: The entire DCAU. And it's still a few months away, I'm afraid. The Very Soil still has at least a month or two left, and I'm probably going to take a break before I start NA09 in order to do a metric fuckton of reading. If I were to do something of this depth on FMA:B, it would be less semiotic and more of a craft thing, taking the series as a masterclass on constructing character and narrative. I'm not sure I have the skills to do that. A fault, perhaps not. It's definitely a flaw though. And yes, her actions in Rebellion are understandable, but that's true of any action by any person if you take the time to try. She is a sympathetic character, but that doesn't mean her actions were correct–nor does doing the wrong thing mean that someone is automatically unsympathetic. Something tells me you've seen this. It's interesting that Walpurgisnacht's main motif (besides gears) is the theatre stage, and her M.O. is to turn the world into a play, where it doesn't matter if it's a tragedy because it's all part of the script. Just as Homura is attempting to change the narrative course of Madoka's arc(s), so Walpurgisnacht represents the metafictional narrative railroading that Homura is trying to break free of and erase. Only Madoka is able to truly take down the narrative restraints and thus free Walpurgisnacht from her fury. No, actually, I hadn't seen it. Ooh, excellent point about Walpurgisnacht's theatre motif. I think it's inevitable that Walpurgisnacht was not in Rebellion, because she represents the Wheel of Fate, which has been subsumed by the Law of Cycles. Now that Homura has usurped the Law, it's possible Walpurgisnacht could return, but likely only as an aspect of Homura. I'm not very familiar with Buddhism, so it may be that I'm missing something important here, but taken at face value this seems to be saying that, well, “all binaries are illusions.” If that is so, why do any distinctions matter? How can one prefer a particular outcome to another, or if such a preference isn't justified, then why take any actions at all? Or maybe as Homura's champion? That would be suitably ironic. Damn, I was hoping to slip that fix in before anyone caught it. Ah well, you got me. Keep in mind that I am far from an expert on Buddhism. I've done some reading, taken a couple of college courses, that's it. But basically, as far as I understand it, yes, all binaries are illusions. In fact, Buddhism goes further than that: all distinctions of any kind are illusory. As for preferences, one of the Four Noble Truths (the core beliefs which underlie the religion) is that desire is the cause of all suffering. A key part of attaining enlightenment is freedom from desire. This creates two paradoxes, both of which are acknowledged within Buddhism itself. The first is that if you have to shed all desire to become enlightened, then at some point you have to get rid of the desire to become enlightened and the desire to be free of suffering–so why don't people lose interest and give up just shy of enlightenment? That one tends to get answered differently by different schools or sects. The other paradox is that the Buddha was enlightened, but he did things. If he wasn't motivated by some kind of desire, why did he do them? That one actually has an answer, which is a common one among mystical schools–Qabbalah, Gnosticism, and transhumanism all include this idea, namely that the experience of enlightenment is so completely different from being unenlightened as to render the enlightened essentially incomprehensible to us. To clarify, I knew people were taking pictures that looked like people whispering to each other and captioning them with “Hail Hydra,” but I hadn't actually seen any yet when I made this post. That it would. However, I would have expected her champion to be Homulilly. True and I don't think Homura did something moral in Rebellion. Then again, I don't think she did something wrong either. Was there really a right answer to the dilemma she was faced with? 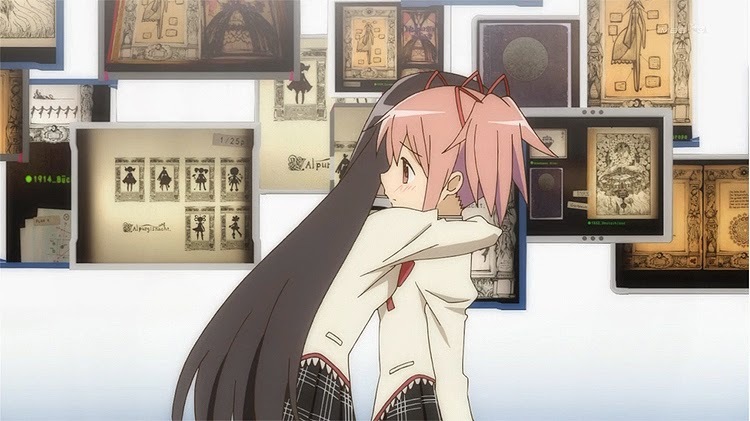 I also find it interesting when you look at Madoka and Homura's relationship that neither on of them can stand being the weaker one, the one being protected. First Madoka protected Homura, then Homura wishes to be strong enough to protect her, then Madoka defied Homura's wishes and became a god, then Homura defied Madoka's wishes and forced happiness on Madoka by becoming the devil. I don't think any true resolution can be reached until they both sit down and are true to each other as equals. Then maybe we'll see a compromise that both parties can accept. Well I mean champion in the sense that Madoka has a champion in Sayaka. Homura basically *is* Homulilly at this point. Ah, I thought you meant in the sense that Sayaka has Oktavia. Yeah, okay, I can see that. @Alex: If Homura was acting to preserve her own life, then her actions would be justifiable as a sort of cosmic self-defense. Of course this is not the case, but Homura certainly seems to believe she is bringing Madoka back to life. I think if Homura was actually willing to explain herself there would be less of a problem. @universalperson: I actually think Homura changing the universe to save her own life would be more selfish. In Rebellion, Homura's changed the universe not her her sake, but for the sake of Madoka's happiness. Homura can't be with Madoka in the new world and is obviously feeling extremely guilty over what she's done. She's sacrificed her own happiness for the sake of Madoka. Plus it seems that magical girls are saved from despair and all of the main characters are alive and happy. The Homuverse currently has no obvious downsides apart from the memory wiping thing. Homura is the quintessential human. She suffers through the endless, and self inflicted, reincarnation due to her stubbornness and clinging onto the duality. The homuverse is but another reincarnation. To Buddha's eye, reincarnation itself is suffering, doesn't matter whether there is a good ending or a bad ending. In this sense, Homura deprives Madoka, Sayaka and others the chance to transcend the duality and to achieve enlightenment. This is not evil; this is human. I'm guessing one is not permitted to invoke “all distinctions of any kind are illusory” in one's own defense? That's probably considered cheating. But then again, the distinction between fair and unfair is also an illusion, right? About the “freedom from desire” thing, yeah, that's kind of what I was getting at. Schopenhauer had much the same idea, that the will is the real source of all suffering, and the answer is asceticism and denial of the will. Given how strongly Nietzsche railed against that pessimism and asceticism, it's no surprise that eternal recurrence, the death of god, etc. show up in Rebellion. @Alex: Yes, but she also altered Madoka's life without asking first, which brings to mind the whole consent issue Froborr brought up in previous entries. I would say that Homura had the right to reject Madoka's salvation to save her own life, but the fact that she's doing it for Madoka's life makes it more of a morally grey area since she is doing it without Madoka's consent. Homura speaks of “wherever you [Sayaka] were before” as if that place is still unknown to her – as it apparently is, so Homura hasn't usurped the Law in the sense of fully incorporating it into herself. Instead, she has established her dominion over ordinary space as Madoka once held dominion over the other space, and taken Madoka, Sayaka, and Nagisa from that other space into ordinary space as the Law takes witches from ordinary space into the other space. Without Madoka, what is left in that other space? An accumulation of all witches that would have been born up to the present time, less Octavia and Charlotte. What was Walpurgisnacht? An accumulation of many witches. If there is anything post-Rebellion that can be said to be Walpurgisnacht, it is that which still dwells in the other space, and they are a perfected Walpurgisnacht. It's an interesting idea, certainly, but I see two issues. First, the anime and paratext alike are deliberately coy on whether Walpurgisnacht is one which or many, while this would confirm that it's many. Second, yes, the witches are in Madoka's pure land, but so are the magical girls. Presumably, like Sayaka/Oktavia and Nagisa/Charlotte, they are now fully one. So that version of Walpurgisnacht would not rampage, it would be under the control of the magical girls just as the witches in Rebellion were.